Thank you for your support. We look forward to the opening of lots in late November 2019. Check back at this web page for opening date and Christmas Tree Lot Locations. CLOSED: Save $5.00 On A Christmas Tree. CLOSED: Click on coupon above and browser window will open with just the coupon. Print and present to tree lot clerk for a $5.00 discount on a $30.00 tree. Smart Phone Coupon. Click Here to load your coupon. Just show coupon on your smartphone to the clerk for your discount. #3 Woodlot/ U-Haul (5150 SE Santiam Highway. Not displaying a live tree this year? Please support Albany Helping Hands by purchasing a Holiday Wreath at any one of our five lots (locations above). Save $5.00 on your Christmas Tree. 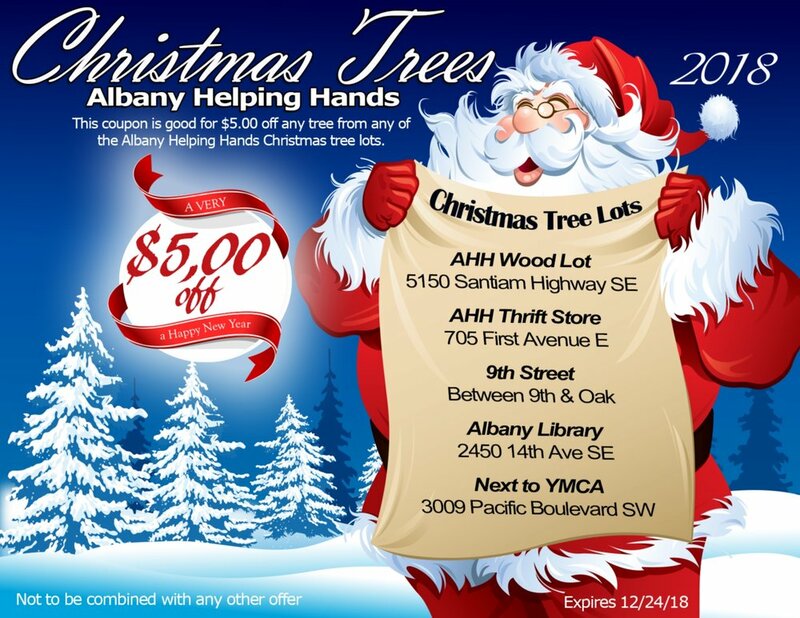 Click here, print coupon and present to the Albany Helping Hands Christmas Tree Lot Attendant and save $5.00. Please feel free to copy or print out the $5.00 discount coupon on this web page and pass the copies along to friends, family and coworkers so they can also save $5.00 on a tree. The proceeds from these sales help fund critical community missions including providing emergency housing and hot meals three times a day, totally over 87,000 meals a year. Albany Helping Hands also provides training and employment for shelter guests operating a Thrift Store, Keep Warm Woodlot, U-Haul, Vehicle Resale and Estate Cleanup unit. If you prefer to talk with management please contact Pastor John Leon or Wayne Oakes at 541-926-4036.